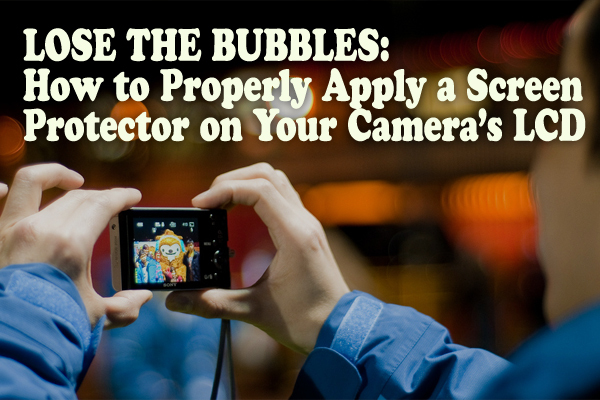 So why put up with them on your camera’s LCD? If you’ve ever tried to apply, or thought about applying, or even looked at a screen protector before – you might want to read this. Fancy receiving a ‘spanking new Nikon D800, only to find a wafer thin scratch down the main screen within weeks. You were careful with it, sure. You would be, having shelled out so much. You might even (for a split second) think it may have been wise to keep that bulky polycarbonate-protector freebie that came with it. Which now seems more appealing, even with the cheek indentation and embarrassment it would have caused. But I get customers coming to me frequently, who despite having taken an immense amount of care over their pride and joy have somehow managed to get a scuff or two on the LCD. When I talk to them further, I usually find they didn’t apply a screen protector before because either they hadn’t thought to – or simply they were put off with the general pain of installing one. 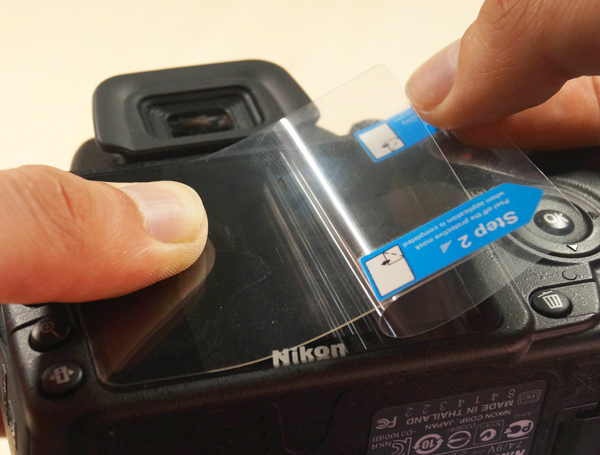 You can apply a screen protector to your camera’s LCD screen in minutes, without bubbles, without hassle. True story. Here I’m going to run through a fail-safe guide, with some helpful tips for a stress-free application. The biggest problem with fitting a protector is bubbles. Sure there can be other problems, but mostly its bubbles. We all hate bubbles. And the cause of bubbles? Well, if you can’t just push them out to the edges, then they’re nearly always caused by dust. Dust is your enemy, remember that. You want to get yourself into an area with as little movement around you as possible. Ideally without wearing a massive woolly jumper either. The ideal environment is in the bathroom, just after steam has settled from a hot shower or bath. The moisture in the air settles any dust. It doesn’t need to be super steamy, just a little will do. Failing that, the kitchen with the kettle on. 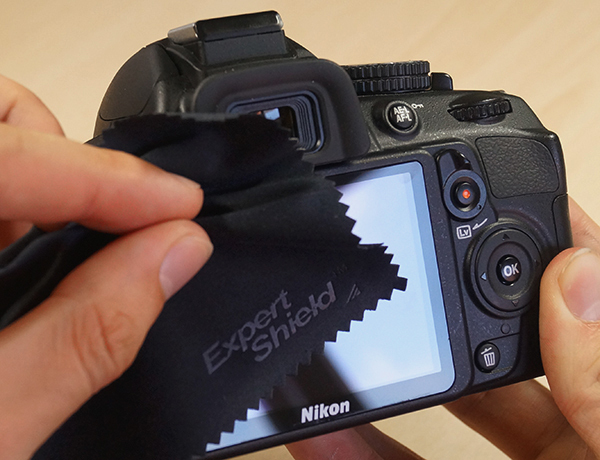 Before cleaning the screen, it’s a good idea to lay the protector on your LCD to get a feel for how it aligns. Slide it around to see how much room for error you may have at the edges, or if the bezel is particularly unusual. Now let’s clean the screen. This is the single most important task, just making sure there’s not a single speck of dust on the screen before you begin. Don’t just rely on giving it a wipe down with the cloth, reflect some light off the screen so you can pick up any specks of dust. Only once you’re sure there’s not a speck on there, can you begin to fit the screen guard. Peel back about 1 inch of the ‘Step 1’ layer to expose the gel-like sticky side underneath, you want to make sure this freshly exposed side isn’t left exposed for very long as dust can settle on it. Now align the exposed edge with that edge of your screen, and begin to push it down and chase out the bubbles. If the protector you have is a good one, it will just chase out the bubbles without much effort. Now slide your finger along the screen, while peeling off the remainder of the ‘Step 1’ layer. Once you’ve discarded the ‘Step 1’ layer, just chase out any remaining bubbles. The best way to do this is with a credit card wrapped in the cloth you received with your protector. Once you’ve finished, carefully peel off the final ‘Step 2’ layer – being careful to make sure you don’t peel the actual screen protector with it. That’s it! You’re now looking at what a nicely fitted protector should be like. If you do have any bubbles still, you should be able to remove them with the sticky tape technique. If this isn’t the case, just get in touch with the retailer you bought your screen protector from and (if you ask nicely) they might just send you a replacement to try again. Now generally it’s a bad idea to cut your own protector to fit. I never recommend customers cutting one of ours to fit, instead I’d much rather they buy their correct size from someone else (if we don’t stock their model already, that is) so that they end up with the perfect fit – than ham-handedly butcher one themselves. That being said, sometimes you’d like one for an older camera, or a rarer device that’s lesser known – and for these devices it can be a nightmare to find the correct sized screen guard for it. Let’s look at how you’d go about cutting a protector down to size. 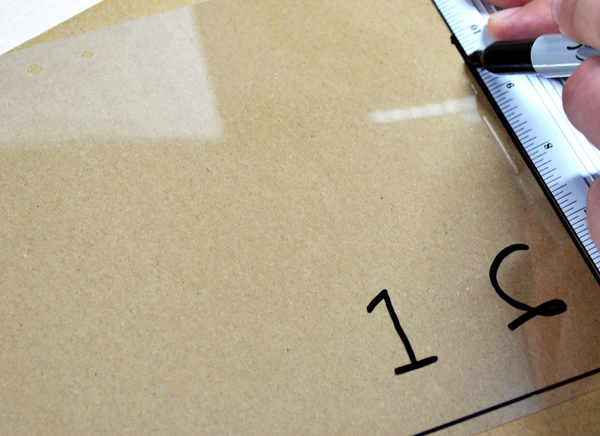 You’ll need: A sharp scalpel (or paper guillotine), a metal ruler (or paper guillotine) and a fine tipped marker pen – like a Sharpie (or paper guile… no, just kidding – but you will actually need a Sharpie). …and of course a bit of screen protector film larger than the screen you want to protect. Ideally a few sizes larger, to allow yourself a few attempts if you get it wrong. But you won’t by the way, because you’re reading this dead-helpful tutorial. First, with the marker pen write on the side that has the “Step 1” tab the number “1”, and “2” on the “Step 2” side. This is because you’ll likely be cutting those tabs off the protector, and you don’t want to get mixed up which protective layer is which. 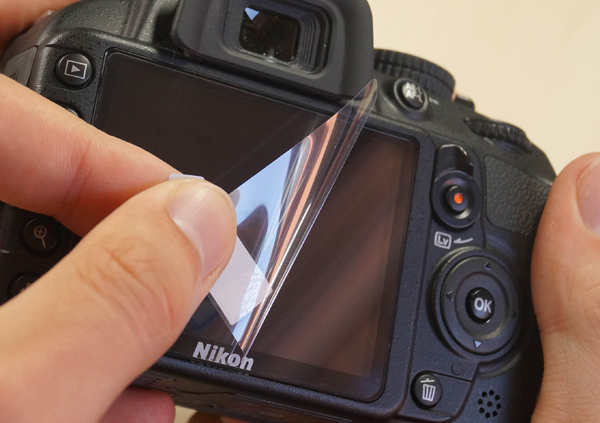 If the piece of protector film you have has curved corners that are more curved than the corners on your cameras screen, you’ll want to cut all of the edges down by about ½ inch so you have fresh, crisp corners. Careful you keep the edges perfectly 90° – you don’t want to end up with some crazy rhombus. Side one corner of the protector film right up to the edges so it sits nicely just inside the bezel of your screen. If you can’t do that because the screen is an odd shape, simply overlay the protector over the screen so that you can trace the edges with the pen. If all the edges are straight you’ll want to use the ruler too. 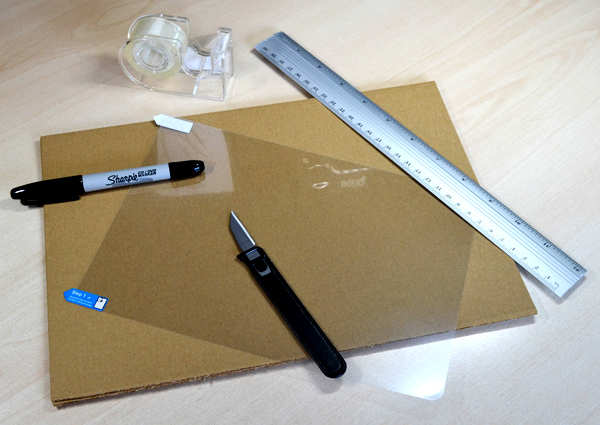 Once you’ve traced the edge of the screen, you can begin to cut it down to size using your scalpel or paper guillotine. Never use scissors as they can distort the edges of the protector, and don’t underestimate how sharp you need that scalpel – the film can be very tough. Try to be very precise here; you may think you’re saving yourself hassle by cutting slightly larger to start with, thinking you can then take bits off later. In theory you can, but if you’ve ever shaved one side of your face and tried to match your sideburns/beard/eyebrows (I won’t judge) exactly with the other side – you’ll know what I mean. Once you’re happy with the fit, and it sits nicely on your screen (you may need to trim those crisp corners if your screen has slightly rounded corners too) you can begin to apply as normal. To replace those tabs you cut off, you can use pieces of sticky tape an inch or so long at the corners to remove these protective layers. Again though, I would always highly recommend getting a protector the exact fit for your camera or any device for that matter. If you don’t yet have a screen protector or are looking for one, my company offers a good range of camera models that can be viewed here, (we ship worldwide) – all come with a lifetime warranty against bubbles and scratches. If you have any questions at all, please don’t hesitate to mention in the comments below and I’ll respond myself.